Guaranteed to make your horse calmer and easier to ride. Unique double action formula guaranteed free from prohibited substances. Relaxme combines magnesium, vitamin E and B group vitamins to create a calmer more easygoing horse. After years of research and many trials, RelaxMe was developed, and the feed back from riders in those early days was amazing. Today as more and more competitors and trainers from every equestrian discipline discover the benefits of RelaxMe the response and success stories grow and grow. 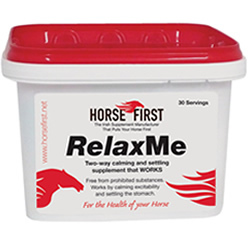 More than just another calmer RelaxMe gives you calm, less anxious horses and ponies which have a quiet confidence in their own natural abilities. The dual action of RelaxMe, working on both the gut and nervous system means the one effect you see and feel is coming from our two pronged approach. So no matter what level you compete at, or if you ride for pleasure, you will gain so much more form giving RelaxMe. Maximum effectiveness of RelaxMe requires a loading period of seven days (two scoops twice daily), in rare cases this period may need extending or the dose increased. 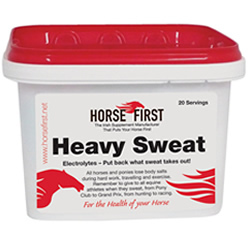 Then you reduce the dose to maintenance level approximately one scoop per day, by knowing your horse you will be soon able to establish this specific level for your horse or pony. If you are taking your horse to a show, event, or competition you can increase the dose for one or two days before. With a unique blend of Liquorice and Silica for optimum gut health and absorption. The All in One Supplement that delivers on Six Fronts. When you want one supplement to cover all. 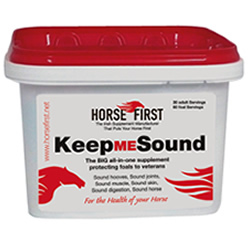 By giving Keep me Sound you are ensuring that you horse will be gaining all the essentials for total health, . Muscle supplement. Joint supplement. Vitamin supplement. Hoof supplement. Digestion supplement. Coat supplement. The Full Range of Horse First products are in Stock or can be ordered for you on request.